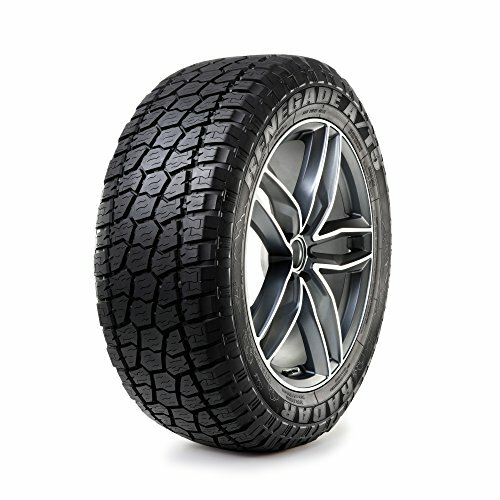 The pinnacle of all-terrain offerings from Radar Tires, the Renegade A/T5 is a premium all-terrain tire range. Designed specifically for drivers who like to venture off–road but need an assured ride on-road as well. The A/T5 features the innovative and unique stone-ejector-technology that prevents stones from drilling and lodging in the tread. It also features a tough 3 ply construction for increased puncture resistance and stability. This range is designed for high powered SUVs and Light Trucks. The Renegade A/T5 has the 3PMSF (Three Peak Mountain Snow Flake) symbol that makes this tire range officially approved for winter use. If you have any questions about this product by Radar, contact us by completing and submitting the form below. If you are looking for a specif part number, please include it with your message.